Nigerian defence forces are said to be preparing to launch a major military operation against Boko Haram. However, the security apparatus acknowledged that it does not have the capacity to engage in an operation against the Islamist insurgency group as well as effectively secure the planned electoral process. Against that background, the electoral commission announced on 7 February that the series of elections, which were initially planned to start on 14 February, would be postponed to commence on 28 March. Opposition parties have decried the decision, condemning it as a calculated response from a ruling party that finds itself in a difficult political position. 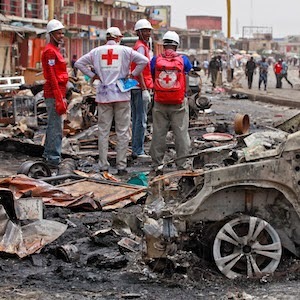 Perhaps the announcement of the proposed offensive – as politically opportune as it may be – also stems from mounting regional and international pressure to address the increasing threat posed by Boko Haram. ‘There will be no foreign boots on the ground in Nigeria to combat Boko Haram.’ For months, this has been the invariable answer of Nigerian authorities when offered help to tackle the group. Yet, last week, Chadian troops entered Nigeria from Cameroon and engaged in intense fighting with the militant group in the town of Gamburu. Fighting took place just a couple of days after the African Union (AU) Peace and Security Council authorised a revisited Multinational Joint Task Force (MNJTF) against Boko Haram at its 29 January meeting, ahead of the summit of the AU Assembly held in Addis Ababa on 30 and 31 January. Although these developments were largely interpreted as a shift in Nigeria’s foreign and security policy, a closer look at the situation indicates that Abuja’s position has not deviated that much. The country remains reluctant to allow foreign intervention on its territory, and still aims to retain ownership and exert its leadership in any attempt to combat the terrorist group. Granted, Chadian troops have entered Nigeria – but it was within the framework of a bilateral military agreement, not a multinational force. As for the AU-authorised MNJTF, it will not be deployed in Nigeria, but along Nigeria’s outside borders within neighbouring countries, with the aim of containing the terrorist group’s regional expansion. For those who continue to worry about the kidnapped Chibok schoolgirls and other victims of terrorist acts perpetrated by Boko Haram, the details of the MNJTF deployment come as a major disappointment. The MNJTF appears largely out of sync with what would have been needed on the ground, in Nigeria, to eliminate the threat posed by Boko Haram. What would have been required, it seems, is a rather robust force such as the African Union Mission in Somalia (AMISOM), which has been combatting al-Shabaab Islamists since 2007. The format of the AU Regional Cooperation Initiative for the elimination of the Lord’s Resistance Army (RCI-LRA), which was established in 2011, could also have been envisaged. Another model could have been the initial configuration of the African-led international support mission to Mali (AFISMA), in which the national army was intended to spearhead operations, with support from the African force, to recapture territory in northern Mali that was being controlled by a mixture of secessionist and jihadist armed groups. Instead, with ‘contingents deployed within their national territory,’ the MNJTF is to be mandated to conduct ‘operations aimed at preventing the expansion of Boko Haram, as well as other terrorist groups and eliminating their presence’. It also aims at facilitating ‘the conduct of joint/simultaneous/coordinated patrols and other types of operations at the borders of the affected countries’. The AU’s authorisation of the MNJTF was requested by member states of the Lake Chad Basin Commission (LCBC) – Cameroon, Chad, Niger, and Nigeria – as well as by a non-member state, Benin, after a 20 January ministerial meeting in Niamey, Niger. The planning conference to develop the MNJTF’s concept of operations took place in Yaoundé, Cameroon, last week from 5 to 7 February. It was agreed that the 8 700-strong force headquartered in N’Djamena, Chad, would be authorised to exercise a ‘right of hot pursuit’ on Nigerian soil. Agreeing on a concept of operations is considered a crucial step in obtaining the United Nations’ (UN) legitimisation – and perhaps funding – for the MNJTF through a UN Security Council Resolution. What we are likely to witness in the near future is Nigeria attempting to tackle the insurgency on its national territory while regional and international partners, within or outside a MNJTF framework, secure border areas to prevent Boko Haram from further spilling over into neighbouring countries. Until recently, Nigeria was still considering the Boko Haram problem as a strictly Nigerian issue. The country’s status as a regional, even continental, power in political, military, economic and demographic terms made it difficult for both African and international partners of Nigeria to challenge this assertion, despite serious military setbacks. But large swathes of Nigerian territory began to fall under the control of Boko Haram, increasing the number of refugees who flocked to Niger, and the group started perpetrating attacks in northern Cameroon as well as threatening trade routes to and from Chad. It became glaringly obvious that the situation was out of hand, and that the response of the Nigerian government was insufficient. With Abuja seemingly unable to suppress the insurgency, yet refusing military assistance in the form of a multinational foreign intervention on its territory, only a middle-of-the-road solution was possible. The MNJTF, in its current structure as a regional attempt to contain the threat, was the only acceptable form of foreign intervention Abuja could tolerate. Without Nigeria’s buy-in, however, no lasting solution to the Boko Haram problem appears possible. The uncertain political context, with general elections looming, further complicates the much-needed national reaction. Nigeria’s reluctance for a regional intervention on its territory can also be linked to the suspicion that characterises the relationships between some of the countries surrounding Lake Chad. It is precisely to settle disputes and bring these countries closer on development, security and integration issues, that the LCBC was founded in 1964. It is also in that spirit that the predecessor of the MNJTF, called the Multinational Joint Security Force, was created in the 1990s to deal with cross-border security issues in the Lake Chad region. At its 14th summit of heads of state and government, held in Chad in April 2012, the LCBC decided to reactivate the force and extend its mandate to include containing Boko Haram. The headquarters of that force, located in the city of Baga in Nigeria’s Borno State, fell in the hands of Boko Haram at the beginning of January. Since the inception of the MNJTF, Abuja has either diplomatically boycotted the initiative or manoeuvred to ensure it would remain in the driver’s seat of any military endeavour. In addition to the difficulty of addressing such a multifaceted challenge, explanations for this behaviour are to be found in issues of sovereignty, national pride and political image. Partners of Nigeria should keep these factors in mind when engaging the country on the question of Boko Haram. Clearly, the LCBC-led MNJTF, in its current configuration, is needed to contain the regional expansion of Boko Haram; but it makes sense only if Nigeria fully plays its role in fighting the insurgency on its territory. In that regard, regional and international pressure appears to have triggered a long-awaited national response. As Nigeria and its neighbours prepare to undertake major military operations, it is worth mentioning that any long-term solution will require an approach that goes beyond security and military responses. Such an approach should also include development and policy responses that will make it more difficult for groups such as Boko Haram to tap into legitimate grievances of people in marginalised regions.